Wake up feeling well rested and refreshed when you sleep on this invitingly firm mattress. Tantalizingly comfortable, this lusciously firm mattress is just the thing you have been looking for for that perfect night sleep. 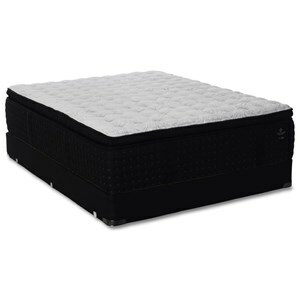 The Sealy Classic Coils support you like a dream, and the new open coil design and edge for greater stability and support create a sublime place to sleep. Foam construction completes this mattresses amazing support system, ensuring you get an revitalizing night sleep every night. The Sealy Brand Level 1 Queen Firm Mattress and Foundation by Sealy at Beck's Furniture in the Sacramento, Rancho Cordova, Roseville, California area. Product availability may vary. Contact us for the most current availability on this product. Fire Barrier Information FlameGuard Rayon Fiber encompasses the mattress for protection from fire. Note: Mattresses manufactured for sale in Canada are not required by law to have fire barriers. The Sealy Brand collection of mattresses by Sealy gives you an ideal blend of comfort, support, and value. Designed with a new look and stylish profile, these mattresses feature the contemporary style and quality you're looking for at a more affordable price. The SealyTech Innerspring provides the deep down support that is the cornerstone of the Sealy brand, ensuring a restorative sleep experience. Offered in a range of comfort choices, enjoy a restful night’s sleep every night with a mattress from the Sealy Brand Collection. The Sealy Brand Level 1 collection is a great option if you are looking for Mattresses in the Sacramento, Rancho Cordova, Roseville, California area. Browse other items in the Sealy Brand Level 1 collection from Beck's Furniture in the Sacramento, Rancho Cordova, Roseville, California area.